Former intern Claire tells us about her experience at VOICE, and why YOU should support our Indiegogo campaign! When I was young, my mother began taking me on what became a tradition of Mother-Daughter weekends. Each year, beginning when I was about six, my mother and I would drive to lake town or mountain cabin to spend time together and talk about growing up. My mother brought different books and guides with her, so along with hiking, swimming, and shopping for souvenirs, we read and talked about the life changes that would come in the next years. The care that my mother took to give me resources and a space to grow gave me the confidence to be myself in my community and in the world. Those trips are a huge part of why I have the courage to be myself today. 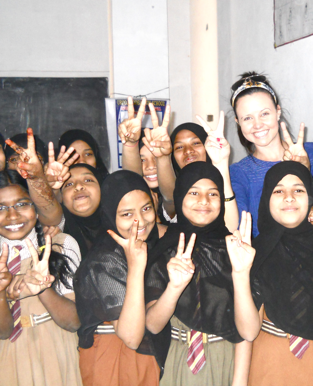 As I began working with students and teachers in schools in Hyderabad, I was reminded of those trips in the strong connections between the women in the school community. I spent afternoons after school having chai and snacks in some of the young women’s homes with their mothers, chatting (in my very terrible Hindi) about our goals and our futures. One young teacher admitted that her ultimate goal was to be a businesswoman, and she hoped her future husband would let her work after marriage. Another day, a whole group of students and teachers gathered in a circle around me to ask about what were the best kinds of exercise and what to eat before a workout, and finally made me promise that I would bring in some workout tapes the next day so they could exercise in their homes. One morning, I had a brief huddled conversation in hushed tones in the corner of a classroom – some young women wanted to know what kinds of bras were the best! Throughout the year I worked at the schools, I was continuously amazed by how these students and teachers were so intelligent, creative, and enthusiastic to learn. They just needed the resources to teach them everything they wanted to know. They needed a safe space away from everyone and everything else, just for girls, to talk about the unique challenges and changes that they face. This is exactly what VOICE 4 Girls provides. During Camp VOICE, girls have the opportunity to gain the knowledge and skills that they want to successfully navigate their lives as they grow up. With the help of their counselors and role models, girls learn how to communicate and lead so that they can advocate for themselves and their futures. And in the girl-safe environment, both girls and mentors have the ability to talk openly and bravely about the things that concern them, challenge them, and excite them so that they all can figure out how to face these issues together. VOICE gives girls and young women the resources and the space to allow them to gain confidence, courage, and new possibilities. After one summer of Camp VOICE, all of my teacher and student friends said that they had learned more than they could ever have imagined. Now, VOICE 4 Girls is trying to give this same opportunity to over 6,000 girls in Andhra Pradesh and Uttarakhand – the opportunity to gain the confidence they need to be themselves and change the world around them. Today I ask you to help us in this mission by becoming a VOICE Champion, either by donating to our current campaign or spreading the word about our cause. Your help will give these girls the chance to advocate for the best possible futures for themselves and to raise their VOICE! Kiera Murphy was a VOICE intern in the spring of 2012. She reflects on her time with VOICE here! 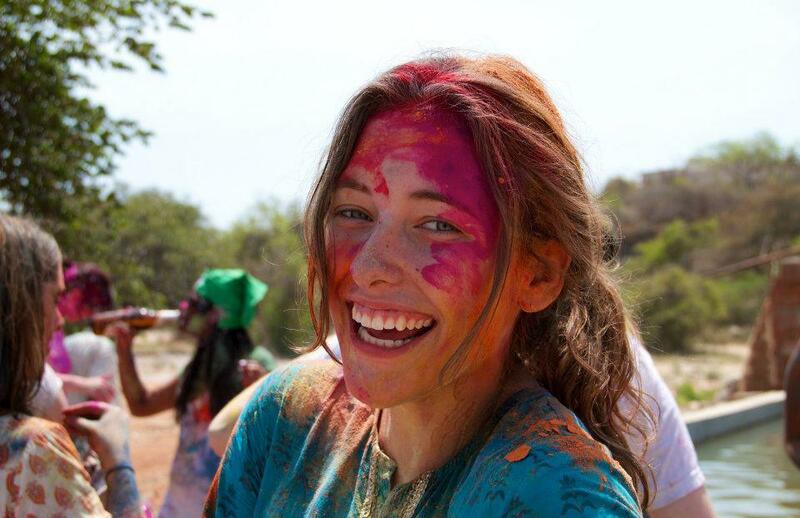 When I traveled to India to intern for VOICE 4 Girls in the spring of 2012, I was entering a great unknown. Now almost 2 years later, I speak of my experience there as life changing. Working for VOICE, I became part of something beautiful: a team of people fighting for a cause that I whole-hearted believed in. I will never forget the first time I met some of the girls that we worked with in camp. Their stories pierced my heart; I was moved by their positivity and desire to accomplish their dreams after overcoming so much hardship. These strong young women gave new meaning to the idea that girls have the potential to be catalysts for change! They helped me believe in myself and my ability to make a difference. Working alongside the women of VOICE as a 19-year-old undergrad, my VOICE journey was invaluable. There was no college class that could have ever taught me what I learned from this hands-on experience. I would walk miles, travel hours by rickshaw to get to work; yet throughout each adventure all I could think about was what we could do to reach more girls. I was energized by the ability we had to empower so many young lives! And most of all, I learned what it meant to be passionate about something. I’m currently working towards my Master’s Degree in Public Policy and Administration with an emphasis on Women, Peace, and Security. I live for my research; I’m willing to do anything to promote the power of educating a girl. My laptop’s desktop picture has not once changed from a picture of the VOICE girls I worked with since I’ve returned from Hyderabad. I see them and am inspired to work harder and dream bigger. Not a day goes by where I don’t remember those girls’ smiles and giggles, or stop to think about why I do what I do. My work at VOICE 4 Girls lit a fire inside my that will only burn brighter with time. I will continue to work for gender equality until all girls have access to the life we all deserve: a life of justice, freedom, love, and dreams. I saw girls become leaders within their VOICE camps, classes, schools, families, and communities. They made me realize how we can all create positive ripple effects in our networks and communities. Today I ask you to become a part of a movement, a revolution. I’m asking both as an individual who saw first-hand the difference VOICE makes in the lives of these girls, and as a woman whose life was also changed by VOICE. In the spirit of Diwali and the beautiful people of India, I ask you to recognize the light inside all of us that has the potential to lift up the world to a better place. As VOICE aims to raise $20,000 this holiday season through their Indiegogo campaign, I urge you to help VOICE in whatever way you can, either by donating or raising awareness about our mission. Raise your VOICE with me!